In the summer of 1985, I found a small doll in an antique store. There was something familiar about her~ she was a doll from my childhood. I decided to search for my other childhood dolls, and I was soon buying doll magazines. but I realized as I gazed at the pictures that I was ready for a new challenge. how hard could it be to make a doll? Harder than you might think, is the answer! It didn't take me long to launch my new career. a step-by-step guide to sculpting a child’s head. & became a passion unlike any I'd ever experienced before. to recognize the calibre of their first attempts, or they might never create another thing. thinking that he would want to know of the genius that he had inspired. when I'd already been accepted as a member, and yes, I did tell him that story! that poor little head should never become a doll. My second effort was considerably better, & I decided that I was ready for the next step. where she won first prize in the original doll category. or that the other doll looked a little like Mr. Potato head. I was hooked! & creating a succession of dolls, each better than the last. One day, a friend told me about NIADA. but also for the dreaded visiting artists’ critique. I created two new dolls, one which was a self-portrait. I’d like to be able to say, “…and the rest is history”, but of course it’s never like that. were nothing like those in the pages of Doll Reader magazine~ they were true art dolls. that lay ahead of us, if we were ever to achieve this pinnacle of success. and finally, I decided that I was ready to apply for membership. "Nope! Not so fast!" they told me! which, it turns out, is the secret to achieving an identity of design. I became a NIADA artist member in 1997.
by Chuck Harley, a representative for Richard Simmons' Collection of the Masters. Would I be interested in designing similar dolls for his company? I tried to remain calm as I told him, "Yes! Yes, I would!" that would become known to collectors as the cousins. It was a great beginning. 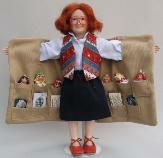 this time as the designer and producer of my own small line of dolls. and Lexie and Jenny~ two little five-year-old friends, were the happy result. and in creating the costuming for the dolls. the dolls have become great favourites with collectors~ they even have their own Yahoo group! In the past few years, I’ve taken a bit of a break from this timeline. with a wreck of a house on it . and I’m finally back to sculpting those little faces. Thanks so much for your interest, and for reading all the way to the bottom of the page.